If your heart has ever skipped a beat, you know it can be a scary experience. Your heart truly is your lifeline, so if it skips a beat, you’ll likely have all kinds of questions. Fortunately, when it feels like your heart has skipped a beat, it is usually nothing to get concerned about. It’s typically something called a heart palpitation, which is a common irregularity in heart rhythm. Most of the time it’s not an indicator of overall heart health or a warning of imminent danger, but it can be scary nonetheless. Most of the time a heart palpitation is caused by anxiety, emotions, or psychological reasons, but different people experience them for a variety of reasons. Sometimes they are physical in nature, and sometimes they might be a symptom of a larger health problem. And sometimes what feels like a skipped beat might not be a palpitation at all, but something more. A heart palpitation is typically accompanied by the feeling of your heart skipping a beat, but it can also feel like your heart is throbbing, pounding or fluttering. The best thing do when you experience a palpitation is to stay calm, breathe easy and do your best to relax. Your heart will regulate its rhythm shortly after the palpitation, so be patient and give it a moment. However, if you experience shortness of breath, lightheadedness or dizziness, it’s advised you contact a doctor or medical professional as soon as possible. In most cases, heart palpitations come and go quite quickly. Some may experience them multiple times per day, but this is rare. And if you’ve noticed that your heart has skipped a beat before, you’re likely aware that it takes care of itself very quickly. You can tell if you’ve had a heart palpitation if your heart experiences an off-rhythm pattern. You’ll likely notice it when the beat picks up again and your heart regulates itself. At this point you may feel fluttering or pounding. Because they come and go quickly, if you go to the doctor it’s very likely the palpitation will have ceased by the time you arrive. If you do go, however, it’s wise to take a couple of mental notes beforehand—especially if you’ve experienced palpitations before. The first is to pay attention to how it feels. Do you feel lightheaded, dizzy, short of breath or experience chest pain? Next, you want to be conscious of your pulse. Note whether it is fast or slow or has a regular or irregular rhythm. You can check your pulse by lightly placing two fingers on the inside of your wrist. Take notice of whether or not there is any consistence with the palpitations. For example, do they occur during periods of high stress, when working out, or at some other specific time? Lastly, recognize whether or not they stop and start suddenly or if you do something to initiate/end them. Heart palpitations can be caused by a number of instigators, and they can appear and disappear suddenly. They are more likely to occur during periods of stress, depression and anxiety, or during periods of increased physical exertion. However, increasing exercise and activity might be a way to fight them off. The right atrium takes in blood from your veins and pumps it over to the right ventricle. The right ventricle receives the blood from your right atrium and pumps it to the lungs where it is loaded with oxygen. The left atrium then gets the oxygenated blood and pumps it through to the left ventricle. The left ventricle, which is the strongest chamber, pumps the oxygen-rich blood to the rest of the body. The left ventricle contractions create your blood pressure. Sometimes your atria can contract prematurely, before they are filled with blood. Because of this, they rest a moment longer than usual so they can get back to their regular rhythm and pump a full load of blood. When this happens, the ventricular contractions are noticeably more forceful as they work to get rid of the excess blood accumulated during the pause. And although it can be uncomfortable and alarming, the good news is that these premature or off-time beats are not life threatening or the sign of a heart attack. A similar feeling can take place when ventricles contract early, setting a beat off rhythm. Once again, it is typically no cause for concern unless it is accompanied by fainting, shortness of breath or dizziness, at which point you should call a doctor. Limit caffeine intake or cut it out altogether: Make a diary and track how much caffeine you’re consuming—coffee, tea, chocolate, diet pills, etc.—and see if you can reduce it. Completely eliminating it all at once may be difficult, so slowly cutting back on it might be the best approach. Healthy diet: Eat regularly and make sure you eat a balanced and nutritious diet. Low blood sugar can lead to heart palpitations, so make sure you eat every four to five hours to keep your blood sugar levels up. Eating foods rich in potassium like bananas, sweet potatoes, beans and beets can help regulate your heartbeat. Drink plenty of fluids: Make sure you drink eight glasses of water each day to ensure you’re properly hydrated and that vitamins and minerals are being transported effectively. It can also keep your blood thin enough to make it easy to pump. Get enough sleep: Sleeping for eight hours every night can help you relax and keep your body functioning at a high level. Mindfulness and meditation: Reducing stress is also a great way to prevent palpitations, so meditation and mindfulness can play a big role. 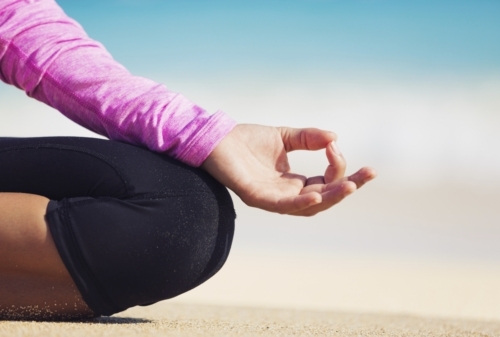 Try things like yoga, tai chi, exercise or anything else that can help you reduce stress. Attempt to regulate your heartbeat by pinching your nose closed with one hand. Close your mouth and try to breathe out hard through your nose. Doing so may force the blood from your heart and get it moving rhythmically, almost like a jumpstart. Splashing cold water on your face or submerging it in cold water may also help bring the heartbeat back to a normal rhythm. If a sink isn’t nearby, then practice deep abdominal breathing or perhaps run for a moment. Vigorous exercise can increase the stroke volume of the heart and help stop palpitations. Thankfully heart palpitations are often of major concern, but they can still be rather nerve-racking. The best thing you can do is remain calm, but call a doctor if you experience any other symptoms like dizziness, shortness of breath or feeling faint. “Skipping a beat — the surprise of palpitations,” Harvard Medical School web site, last updated September 2, 2015; http://www.health.harvard.edu/heart-disease-overview/skipping-a-beat–the-surprise-of-palpitations, last accessed October 21, 2015. Chen, M.A., et al., “Heart Palpitations,” U.S. National Library of Medicine web site, last updated May 13, 2014; https://www.nlm.nih.gov/medlineplus/ency/article/003081.htm, last accessed October 21, 2015.